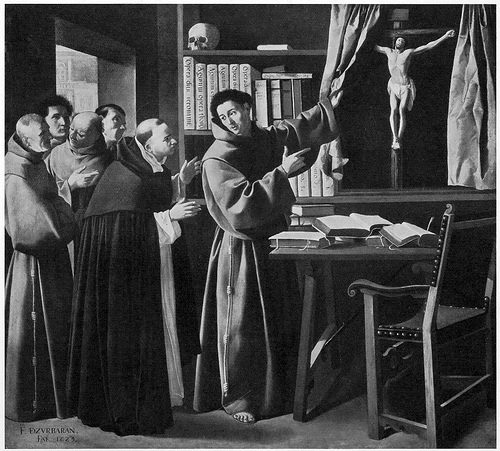 As St. Francis reminds St. Anthony, sacred theology is a great thing to learn, as long as it does not “extinguish the Spirit of prayer and devotion.” Bonaventure and Aquinas, are great men to read, but we must always remember why it is we study in the first place. Now that I’m nearly three months into my third year of formation, I can definitively say that there is a major difference between the first two years (postulancy and novitiate) and the remaining four years (simple profession) of initial formation. Rightly so, the first two years focus heavily on human and spiritual formation, breaking down personal barriers that inhibit proper growth in fraternity and prayer. This meant going to workshops on prayer, sexuality, personality, addictions, interpersonal skills, and the vows; meeting regularly with a counselor to evaluate group dynamics and personal problems; and numerous opportunities for extensive and intense prayer experiences by way of retreats. While there are still opportunities for such experiences (we continue to go to sexuality workshops, are required to have a spiritual director, and will go on a retreat each year), the emphasis has clearly shifted from theory to practice. Unlike the first two years of evaluation and growth, the third year and beyond appears to focus much more heavily on ministry: preparation, experience, and processing. The largest part of this, which I mentioned before without explaining in detail, is our heavy load of intellectual formation. For those of us that feel called to be ordained to the priesthood, there is a heavy academic burden that must be endured. The USCCB has developed a Program Of Priestly Formation that they believe best prepares one to be a priest in the Catholic Church. Academically, this means taking 30 credits of philosophy (with 20 credits soon to be done and each course being 3 credits, I’ll be finished by the summer), and 90 credits of theology in the form of a Master of Divinity (M.Div.) degree. For those scoring at home, that’s a minimum of four years. Courses are to be fulfilled in a wide range of categories including scripture, theology, history, canon law, moral theology, liturgy, spirituality, counseling, and preaching, clearly preparing us for a wide range of situations, but because of obvious constraints, unable to provide extensive depth into any one category. Luckily, as I’ve learned in the past three months, our intellectual formation is not the only formation we receive in our years here. The simply professed friars meet every Monday evening for an hour and half to discuss relevant pastoral topics related to our lives. Usually led by one of the friars in the house, we begin with a presentation on a ministerial experience or skill and then spend time discussing our own experience on the matter. Topics are wide in range and scope with the intention of creating an environment for faith sharing, pastoral growth, and intimate fraternity. Besides the daily ministry experience (of which we are required to get eight hours per week) and our supervisor meetings, we will each be assigned to a friary in our province each summer for a more intensive ministry experience. Stepping completely outside of the academic world, we’re able to apply all we’ve learned in the classroom and in our seminars to the “real world” in hopes grow in our pastoral skills and to have something substantial to bring back to the classroom the following year. Prior to our solemn profession (usually after our third year of studies), we are required to extend one of these summers into full year-long internship devoted entirely to ministry experience. Overall, the nature of our formation is clearly different this year than it was in the previous two years as it is much more laissez-faire and dependent on the individual to develop his own formation. Please don’t misunderstand me: this does not mean that it is any less important or rigorous. What I mean to say is that there is no longer the feeling of being micromanaged with clear boundaries and high structure; we have an opportunity, now having been formed in the way of St. Francis for two years, to reengage the world with what we’ve learned in ways we see fit. It is a time of tremendous life experience as we are given the chance to try new things, to both succeed and fail, and to be stretched by a little bit of “real” stress in our lives. It’s an exciting time with a lot to do! Formation rolls on! ← Really, Would You Do It With Me?